Findlay Mazda is extremely proud to announce the arrival of the 2016 Mazda CX-3 at their Post Falls location. 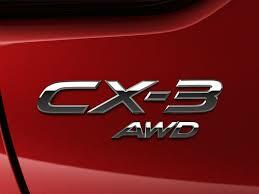 The CX-3 comes in three trim options and a front wheel drive or an all-wheel drive option. The Sport trim starting at $19,960. The Touring starts at $21,960. The Mazda CX-3 Grand Touring is nicely equipped at $24,990. The 2016 Mazda CX-3 is excellently engineered. The performance and efficiency with the new Skyactive Technology. With this technology, the CX-3 will provide one with outstanding fuel economy, and unparalleled driving dynamics at your fingertips. The driver will be exuberant with the EPA estimated 29 mpg in the city and 35 on the highway. In the 2016 CX-3, the new cabin interior is designed to make one feel at ease and confident while behind the wheel. All of the cabins controls and displays are easy to reach, use and see. The CX-3 has eight colors available: Chrystal White Pearl, Soul Red Metallic, Ceramic Silver Metallic, Deep Crystal Blue, Dynamic Blue, Jet Black, Meteor Gray, and Titanium Flash. The CX-3 has safety in mind with these available advanced safety systems. The Mazda Radar Cruise Control can help control distance safely. Smart City Brake Support helps minimize frontal collisions while driving between 2 and 18 mph. The 2016 CX-3’s Land Departure Warning System will alert the driver when the system senses them drifting out of their lane. Along with these features and others, the owners mind can rest easy while driving. Along with new technology, safety features, and new design, the 2016 CX-3 comes great options and accessories. One is Mazda Mobile Start, which will remotely start the new car from up to 300 feet away. If you like road trips, another excellent option one can add on is a roof rack and side rails. If a little more style is needed the door sill trim plates can be added for an added touch to the CX-3. 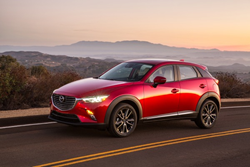 “In totality, the Mazda CX-3 is among the best new entrants into a fast-growing segment. Crossover vehicles are gunning for precedence with a relentless attitude fresh out of the gates. It’s safe to say that the CX-3 is leading this race when it comes to compact crossovers.” states Malcom Hogan, reporter for automotiveaddicts.com. Findlay Mazda is accompanied by two other Findlay dealerships in Post Falls: Findlay Chrysler Jeep Dodge Ram and Findlay Nissan. As a trio, Findlay Auto Post Falls was recently voted Best Auto Dealer in North Idaho 2015. Findlay Mazda offers new Mazda vehicles as well as used cars, trucks, and SUVs. Findlay Mazda services: Spokane, Coeur d’Alene, Post Falls, Liberty Lake, Hayden, Lewiston, and the entire Inland Northwest. For more information or to test drive a new 2016 Mazda CX-3, please contact Findlay Mazda Post Falls at (208) 619-2500 or Toll Free at (888) 904-8267. Findlay Mazda is located at 1665 East Edmonton Ave Post Falls, ID 83854. Complete inventory can be seen at http://findlaymazdapostfalls.com.